Artist Code: 0905. Completed October 2009. Original SOLD. Graphite on Aquarelle Arches 100% hot pressed cotton rag paper. Unframed size 12″ x 16″. What a lovely, friendly labrador. Monty ‘sat’ for me beautifully and this pencil sketch was produced from the myriad of photographs I took. I included his little toy, because when he meets you, even for the first time, he brings his toy and nudges it against your hand in greeting. Monty also likes attending caravan rallies, hence the grassy rally field and easy-chair in the background. 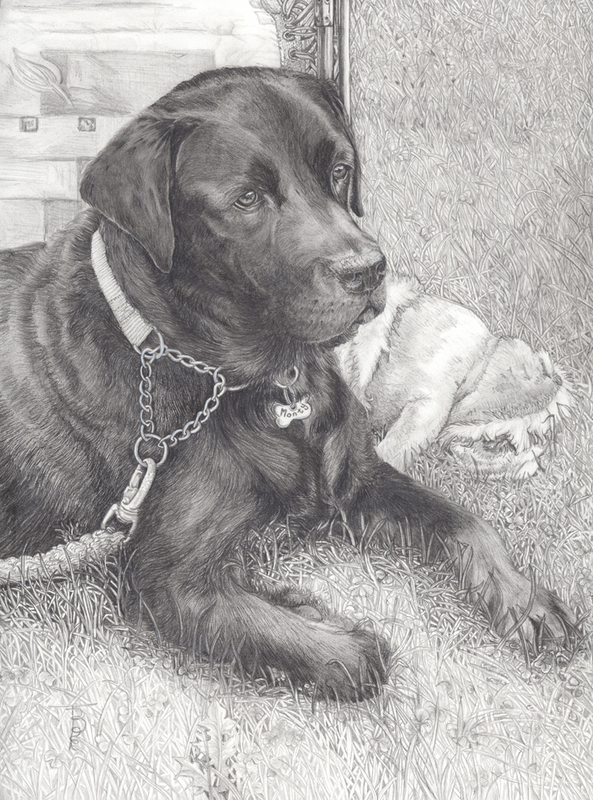 The owners of this beautiful labrador have given permission for limited edition prints to be run from the original commission. He loves his weekend outdoor life!